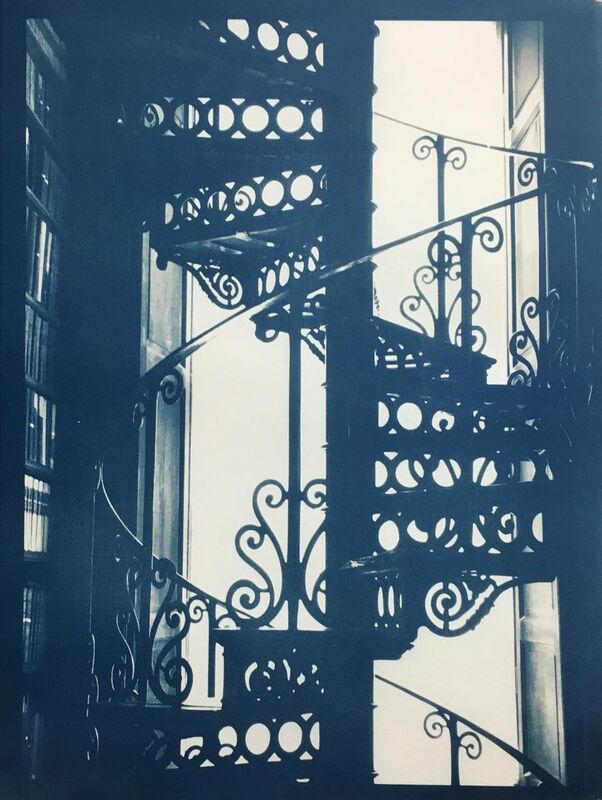 6 Bridges Gallery presents Gail Erwin, Ascent: Cyanotypes, Paper and Wire Sculptures, August 21 to September 29, 2018. A reception will be held on Saturday, September 8, from 7:00–9:00 pm as a part of ArtsNight Maynard. Stairs and ladders are literal means of climbing, of upward movement toward our physical, metaphoric or spiritual aspirations. The ascent, like the stairs, may be straight, leading up or down depending on the obstacles in our path. Or they may be like a spiral stair, taking us on a circuitous journey to our end point. Walls may stop our progress or provide footholds for further ascent. 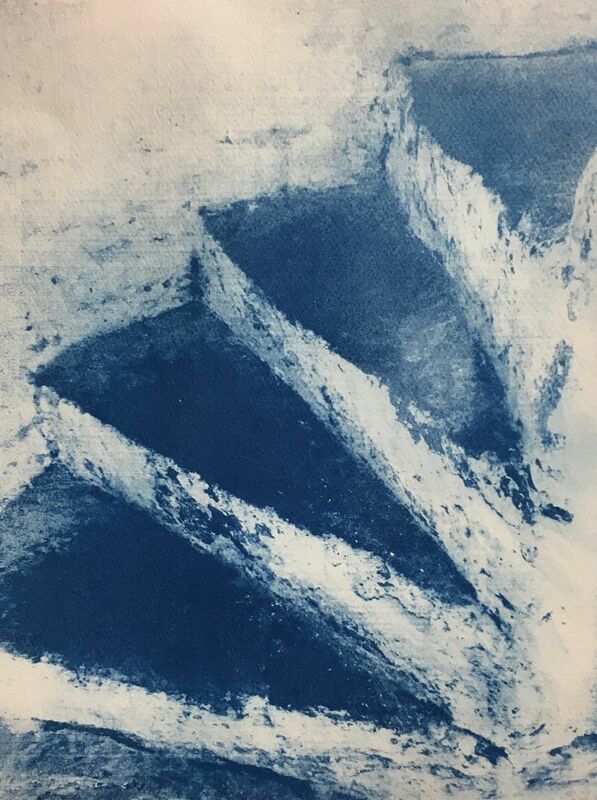 The cyanotypes depict stairs, windows, tunnels and pathways through arches. Where they lead is unknown and mysterious. 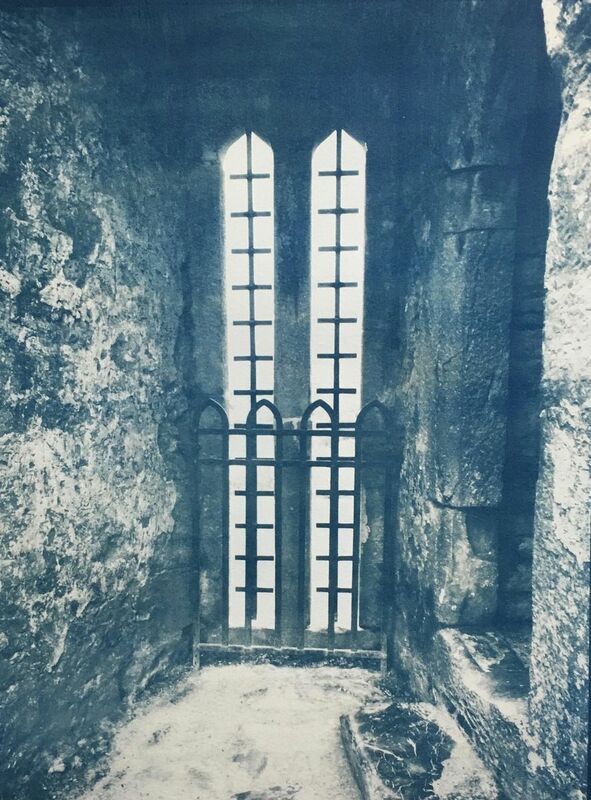 Sometimes the window or way is barred. Or there is an air of danger or something lurking just beyond your vision. The wire ladders and the paper and wire structures are metaphors for both the fragility and strength of our quest. Wire represents strength and endurance Paper is ephemeral and fragile. Hands can hold and protect or reach out to grasp an object, or symbolically, an idea–which may elude capture and is often illusory. Surfaces can confuse. What is behind the seemingly solid paper. It hides wire and yet can provide a window of discovery. Nineteenth century meets twenty first century. 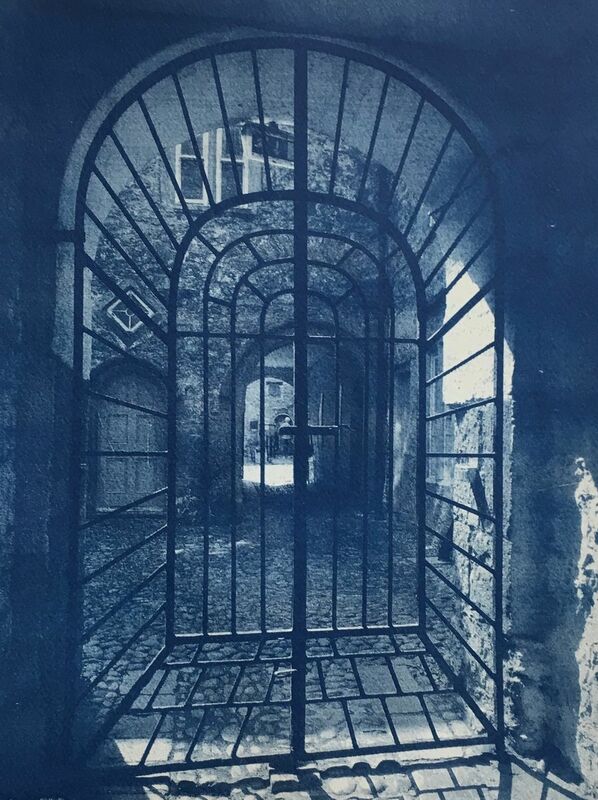 Cyanotype printing is a non-darkroom alternative photo process in which mages are contact printed onto paper or fabric. The surface is coated by hand, exposed to UV light either in the sun or in an exposure unit, developed in water, fixed and rinsed. The process originated in the 1830’s and has been used for architectural blue prints. In the last few years the process has been reclaimed as an art medium. I use my own digital photos and create a digital negative in the computer, and then print it on transparency film. This is what is used as the negative to make these prints. Nineteenth century meets twenty first century.